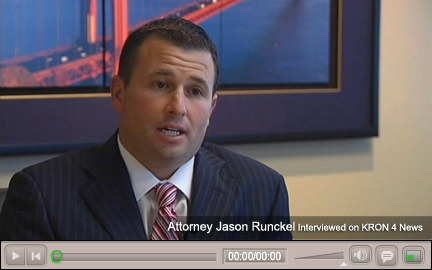 O'Connor, Runckel & O'Malley LLP is a personal injury law firm serving the greater San Francisco Bay Area. Our attorneys represent clients in a wide array of serious personal injury claims. The partners at O'Connor, Runckel & O'Malley have more than 50 years of experience protecting the rights of victims. We have successfully negotiated thousands of cases and have tried and presided over more than 250 jury trials. Our experience and courtroom skills are unparalleled. Let us put this experience, knowledge and expertise to work for you. The goal at O'Connor, Runckel & O'Malley LLP to bring justice to those who have been harmed by the wrongdoing of others by seeking full compensation for their losses. We retain the finest engineers, physicians and other experts to obtain the highest possible recoveries. We are proud to play a role in keeping the justice system strong by protecting the rights of the individual. We are results driven attorneys who bring a strong combination of education, experience, and practical knowledge to the representation of our clients. If you have been seriously injured due to someone else's negligence, contact a personal injury attorney at the law offices of O'Connor, Runckel & O'Malley today. We provide free consultations in order to evaluate your case and discuss the legal options available to you. If you have been injured in a motor vehicle accident due to another's negligence, you may be entitled to compensation. Our attorneys possess the specialized knowledge needed to win maximum compensation in complex cases. Learn More about Car Accidents, Motorcycle Accidents and Trucking Accidents. View court verdicts and settlements to see amounts recovered on behalf of our clients. Call (925) 939-5600 today for a free initial consultation with a personal injury attorney.